Lepo Mikko graduated from Pallas in 1939, in other words, fate had designated the very complicated 1940’s as the starting period of his creative career. Mikko nevertheless did not withdraw. He painted and participated in exhibitions, even though he completed few works at that time and most of them were small format studies. They were strongly influenced by an exhibition of French art that he saw at the Tallinn Art Hall during his last year of school. That exhibition was like a symbolic finale to the admiration of French culture that lasted throughout the 1920’s and 1930’s in Estonia. The works of Picasso, Juan Gris and others did not only decisively affect Mikko – a whole series of painters of that time thought about art differently after leaving the exhibition than they did when they arrived at the exhibition. Thus a certain calm impressionism characterises that early Mikko. Colours are muted and refined, painting is done with the aid of surfaces, and the foundation based on drawing becomes secondary. For this reason, many consider the 1940’s to be a happy period for Mikko, when perhaps his best works were completed. Lepo Mikko graduated from Pallas in 1939 as Nikolai Triik’s student and actively participated in exhibitions in the early 1940’s, living in Tartu until 1944. His creative work was diverse during that period, including figurative paintings, still lifes and landscapes. His body of work from the 1940’s was nevertheless relatively small in numbers and small formats predominate. Creatively speaking, Mikko was at a good and stable level in the first half of the 1940’s, while a certain low point is seen in Mikko’s creative work from the mid-1940’s to the mid-1950’s. Mikko later became most interested in treatments of form, further developments of cubism, the so called strict style, monumentality and semi-compulsory futuristic themes (for instance space travel), for which reason the works he completed in the 1940’s can be treated as a separate period. 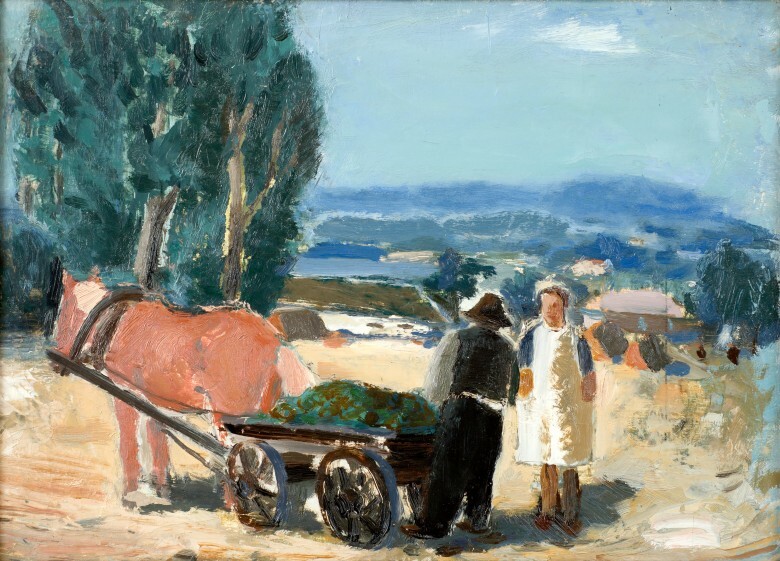 "Man and Woman beside a Horse Cart" repeats many other paintings from that period by Mikko in terms of theme, subjects, dimensions, colouring, attitude, treatment of figures and other such aspects, for instance "In the Meadow" (1942), "Midmorning" (1943), "Making Hay" (1945) and others. The motif of a man and a woman with a horse or a horse cart repeats in the first two of these paintings. Lepo Mikko’s body of creative work from the 1940’s is relatively small in number. Small formats and the form of the study are prevalent. At the same time, Mikko’s creativity was at a good, stable level in the first half of the 1940’s (while Mikko’s creative work from the mid-1940’s to the mid-1950’s is seen as the product of a slump in his creativity). Mikko later became more interested in concepts of form, further developments in cubism, the so called harsh style, monumentalism, and semi-compulsory futuristic themes (for instance space travel), due to which the works he completed in the 1940’s can be considered to form a separate period. In 1939, he had visited an exhibition of French art (Albert Marquet, Georges Braque, Juan Gris, Picasso and others) at the Tallinn Art Hall which greatly influenced his creative works in the subsequent years. He sought muted tones and milder partitions instead of strict partitions (Eha Komissarov). Critics of that time highlight the refinement, modesty and respectability of Mikko’s taste in colour, along with the strength of his compositions. 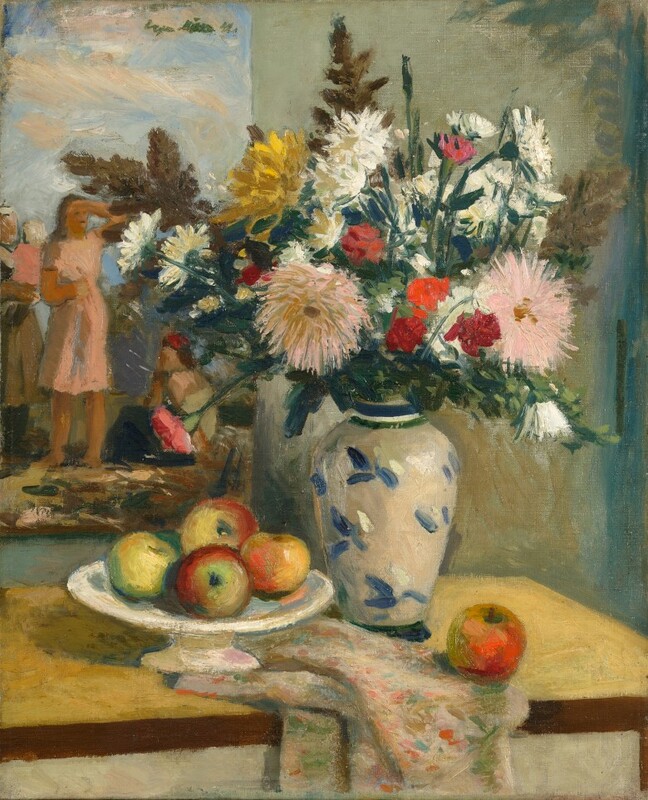 Several views of Tartu from the first half of the 1940’s are the primary works that have stood out in the view of critics, yet still-lifes and small-scale genre pictures depicting rural life also have a place of their own. 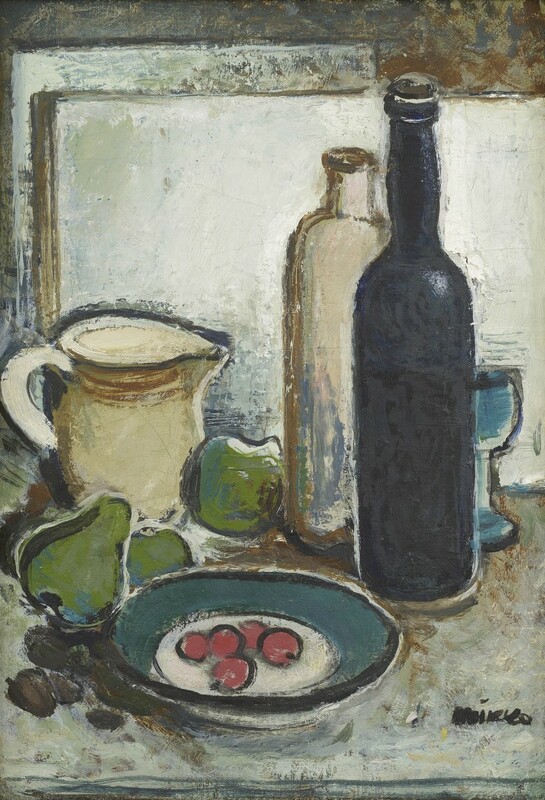 For instance, Natüürmort mandoliiniga (Still-Life with a Mandolin, 1942), Natüürmort kahvliga (Still-Life with a Fork, 1943), Natüürmort kohvilauaga (Still-Life with a Coffee Table), Natüürmort valge purgiga (Still-Life with a White Jar, both paintings from 1943), and others were also completed during the same period.